We’d love your help. Let us know what’s wrong with this preview of Stay Sweet by Siobhan Vivian. Summer in Sand Lake isn’t complete without a trip to Meade Creamery—the local ice cream stand founded in 1944 by Molly Meade who started making ice cream to cheer up her lovesick girlfriends while all the boys were away at war. Since then, the stand has been owned and managed exclusively by local girls, who inevitably A summer read about first love, feminism, and ice cream. To ask other readers questions about Stay Sweet, please sign up. Would this be a good read for a 14-year-old who has interest in poetic language and feminist messages? If you’re tempted to lie in your backyard, under the sun, to get tanned or simply enjoy the outdoors, I certainly encourage you to consider taking this book with you. The concept is fairly original. Who would have thought that an ice cream stand would mean so much to so many people and have its own developed back-story? The fact that Molly started this business during WWII to cheer up her girlfriends whose boyfriends or brothers or fathers were at war is admirable an I smell summer. The fact that Molly started this business during WWII to cheer up her girlfriends whose boyfriends or brothers or fathers were at war is admirable and interesting. Since I got to know her a bit, I found unfortunate what happened to her, although that part is crucial for the story to move in the direction the author wanted. The writing is decent but dry—never lyrical. It made me feel like I was reading a textbook at times, so no particular way at all. It left me indifferent for the most part. Because of that, it’s hard to get attached to the characters like it is possible when authors use figures of speech or lyrical descriptions to affect us and make us really understand what the characters are feeling, but it doesn’t change the fact that Amelia is as sweet as ice scream, if a little naïve, and a lovely girl who is impossible to dislike, unlike her best friend, Cate, who seems to bask in negativity. There are probably a hundred other new books more fantastic than this one to read to get in a summer mood – I am, of course, thinking of the new release The Summer of Jordi Perez in particular – but it doesn’t mean that this one isn’t worth your time still. If you’re interested in reading a light story that will actually teach you some about managing a small business while entertaining you, give this under-the-radar story a shot. This was mega cute and sugary sweet. Definitely the perfect book to read outside this summer! I will say though that I wasn’t at all a fan of the romance in this one; I was WAY more invested in the status of the ice cream shop itself and the bond between all the Meade Creamery Girls tbh. If you’re reading this one hoping for a swoon worthy romance, I would maybe adjust your expectations a little, but overall still a very fun read! Such mixed feelings about this one! I really enjoyed reading about how the ice cream stand came to be & the process of making ice cream but everything else fell flat. The romance was not believable and way to rushed, the main female friendship was catty and our main character Amelia just tried way to hard with her friend Cate. but it makes me want to make and eat ice cream so there's that! I really enjoyed this! it was the perfect light read that I needed right in the moment. The story within a story about Molly, the ice cream stand owner, was AMAZING. I WANT MORE OF HER PLZ. I really liked seeing Amelia grow as a character and learn what she wanted for her future. I also liked Grady and also liked that the love story wasn't really at the forefront of the book. Overall, a fantastic summer read! This, unfortunately, is a solid no from me. Look, I have nothing against fluffy contemporaries. Nothing at all. In fact, I like to seek them out, because they’re refreshing. STAY SWEET, in particular, has this (from the outset, at least) a nice fun summery feeling. It promised ice cream and a a friendly squad of girls and a hint of romance. It looked GOOD, is my point. And I was looking forward to reading it. The main problem, I believe, was the lack of d This, unfortunately, is a solid no from me. The main problem, I believe, was the lack of direction. The plot waffled between one direction and another, never grasping a thread and sticking with it. The main thrust of the plot, including its buildup and fallout, was so simple, so short, that there was all this extra space in the pages to fill up with the most frivolous of details. There were many many chapters of straight up FILLER. Do I care what Amelia’s best friend Cate’s work place looks like, a place that she quits barely three days later? No. Do I care about the type of face mask and lipstick that Amelia uses, and where she bought it from? No. Do I care about tons and tons and tons of descriptions of Grady’s, the love interest’s, blue eyes and abs and every single outfit he wears in a given day, down to the shoes and socks? Hell no. Give me a break, stick to your plot, I beg you. The characters were barely likable. Amelia irritated the everloving hell out of me with her WEAKNESS. She’s weak, okay? She allows Grady to walk all over her, use her to run HIS business, and drive wedges between her and the other girls. And the worst part is? Cait warns her from the get-go not to be swayed by a pretty (blue-eyed very very very *takes a break to breathe* very very gorgeous and handsome and prefect) face. And her friend’s warnings go in one ear and out the other. And speaking of Cait - she’s a terrible friend. Terrible. If Amelia didn’t keep on forgiving her, I would’ve been happy. Though this book claims to be ~feminist~, I failed to find anything faintly resembling that. The way the girls are portrayed - like your stereotypical airheads - grated on my nerves to no end. When Grady calls a business meeting, Cate is distracted because she’s blowing on her newly-manicured toes to dry. When Amelia asks for a stock update, the girls are busy trying on the “most perfect shade of lipstick” that Cate picked up at Walgreens. Amelia envies Cate’s perfectly tanned skin and interrupts her to ask what kind of coconut oil she uses. The girls cut work hours and waste money on balloons and booze. The desk and cash register hold, in addition to receipts and cash, some spare tampons, which everyone giggles and try to hide when Grady walks into the room. And guys, by no means am saying that to be feminine is a negative thing. I complain about books like that, believe me. What I am saying, however, is how girls are portrayed as easily-distracted by stereotypical “””girly”””” things, while all Grady, the sole male, wants to do is succeed in his college courses, save money, make his daddy proud, and get the family business back together. And disclaimer: by all means, I consider myself a girly girl. Some stereotypes apply to me personally: my nails are always painted. I care how I look like. Red lipstick FTW, always. I am also juggling college courses with book blogging. I am an engineer-in-progress. I prefer computers and written words over people. It’s possible to be both the girls and Grady, believe me, and limiting your characters to either is unrealistic. So all in all? I don’t know, y’all. If any of what I mentioned doesn’t bother you at all, then you’ll love this, I guess. But as far as fun contemporaries go? This was NOT fun at all. And it turned me off of ice cream. "But maybe the only thing stopping her were the limits she put on herself." This book is as sweet as the ice cream it sells! The Meade Creamery has been open for business every summer since 1944 and after decades of ice cream and satisfied customers, they have become an essential summer must have. It's not officially summer unless you take a bite out of their delicious homemade ice cream - vanilla, chocolate, strawberry or home sweet home. This summer Amelia has been promoted to head girl. This is her last summer with her bff Cate before they enter college and she wants to make the most of it. When the owner, Molly Meade, dies right before the stand opens, Amelia is in disarray. But when Grady (Molly's grandnephew) arrives with plans to open up the stand with fresh and new ideas, hope blooms in Amelia's heart. This was cute, and sweet, and filled with ice cream - exactly what I was looking for! I wasn’t expecting too much from this except that I wanted a cute, fluffy contemporary to read in the hot spring sunshine. When I came across this novel which deals with girls working in an ice cream stand for a summer, I knew this was it. Some reviews and synopses say that this is a book of feminism which I think is stretching it a bit. Yes, it is about girls having control over an ice cream stand, but the sto This was cute, and sweet, and filled with ice cream - exactly what I was looking for! I wasn’t expecting too much from this except that I wanted a cute, fluffy contemporary to read in the hot spring sunshine. When I came across this novel which deals with girls working in an ice cream stand for a summer, I knew this was it. Some reviews and synopses say that this is a book of feminism which I think is stretching it a bit. Yes, it is about girls having control over an ice cream stand, but the story of it is that everything started because girls back in the days needed to have something to do while their sweethearts were at war. *I would like to thank Simon & Schuster Children’s Publishing for providing me a complimentary copy of this book through NetGalley. This does not affect my opinion of the book and the opinions expressed in this review are completely my own. While I was reading the book, I craved for ice cream the whole time. I suggest you guys have a tub of your favorite ice cream before starting this book because you will need it. This book is such a refreshing contemporary read like no other. The last summer *I would like to thank Simon & Schuster Children’s Publishing for providing me a complimentary copy of this book through NetGalley. This does not affect my opinion of the book and the opinions expressed in this review are completely my own. The last summer before she heads to college, Amelia made sure it will be well spent together with her best friend Cate and, of course, her last year at her summer job at the Meade Creamery as the Head Girl. Everything was going fine but then Molly Meade died just a couple of days before their opening. Amelia's dreams and plans crashes down, saying goodbye to that perfect summer she's aiming for. The characters were realistic enough; teens being teens, figuring their selves out, even though there were times that I got annoyed by some, they eventually developed and were interesting. Amelia grows and was able to handle the hurdles that came to her way. There was a part where I hated Cate because she was being immature and jealous of Amelia. Cate was throwing tantrums and giving cold shoulders to Amelia while she was looking for the recipes to save the stand. I adore the friendship of the Meade Creamery Girls - the kind of friendship a sorority girls have; not the hazing and other stuff, but the bond they have even though they graduated from the stand, they still have each other's back from generations to generations. I'd love to be a part of the Meade Creamery Girls to be honest! I love how Siobhan incorporated a bit of World War II life through Molly Meade's written diary during 1940's. It was written in the diary how Molly started the Meade's Creamery as well as her life as she waits for the love of her life to come back home after the war. I got to know Molly more and her story was included bit by bit through out the book. Molly's back story is probably my favorite part of the book. This book is about empowering young women about aiming their dreams and discovering their selves all the way through. Feminism was also presented in the book through the Meade Creamery Girls, which is something I love. The book also showed the feeling that things will never be the same after summer is over. DNF so I'm leaving off a rating. I love fluffy summer contemporaries, but this one didn't work for me at all. The third person present tense writing was incredibly clunky & awkward, the characters weren't particularly likable (or... real if you know what I mean), and the whole story just felt really stiff and distant. It was too hard to get into and I have other books I'd rather read. Thank you to the publisher for sending me a finished copy. This was amazing! Going to be rereading the final version for sure! Omg I read a book. I also learned that I didn't forget how to read. Maybe I'll even write a review? Maybe? Probably not. Anyways, it's been a good day for me. I can honestly say that this is one of the easiest books to describe and I can do it with one word... Meh. The ending was good but I absolutely had no feelings about anything for like 75% of the book. Fannie Flagg meets YA. Very cute; I’d recommend to anyone who wants a light, fluffy summer read. Amelia starts off her first day as Head Girl for Meade's Creamery by finding the dead body of owner Molly Meade inside the ice cream stand. Thinking this is the end to her summer job and the business, she accepts the truth that her planned summer has been broken into shambles until Molly's great nephew arrives in town. A young entrepreneur, Grady announces that he's taking over the business and the girls sprint around to make the stand presentable for opening day. Everything runs smoothly until Amelia starts off her first day as Head Girl for Meade's Creamery by finding the dead body of owner Molly Meade inside the ice cream stand. Thinking this is the end to her summer job and the business, she accepts the truth that her planned summer has been broken into shambles until Molly's great nephew arrives in town. A young entrepreneur, Grady announces that he's taking over the business and the girls sprint around to make the stand presentable for opening day. Everything runs smoothly until Grady and Amelia realize that they are running low on the ice cream that Molly prepared, and without the recipes to replicate the ice cream, the business is going to tank. I only had two problems with his story. The first was the complete lack of chemistry between Grady and Amelia. They only talked about the ice cream stand, how to make a profit, and searched Molly's house for the missing recipes for 65% of the book. This book didn't even need a romance component since it stressed the importance of a feminist theme. Why not a story about girls banding together to save a business centered around the principle of women intelligence? The second issue was Amelia's best friend Cate who was utterly immature, self-absorbed, and hypocritical. Cate gives Amelia the cold shoulder and throws tantrums because Amelia spends her time looking for the recipes and making ice cream in hopes to keep the business afloat and the girls (including Cate) paid their $15 an hour salary which is ludicrous since all they did was scoop ice cream, laugh, blast music, and chatter. Amelia even sacrifices her title as Head Girl and transfers it to Cate to appease her jealous BFF, but Cate is an awful boss who doesn't know how to do anything and then throws a party in the ice cream stand, invites half the school, let's 13 year olds drink alcohol and then leaves the stand looking like a pigsty for Amelia to find the following morning. Cate had to be the center of attention, and when Amelia dedicated so much of her time to keep the business afloat, Cate whined and stamped her feet and then ignored Amelia until Amelia apologized for hurting Cate's inflated ego and making it up to her somehow. Anyway, I couldn't stand Cate's character and wish she had been written different because she's currently a dead weight to the story. This might be my favorite Siobhan Vivian yet! It's very in the style of her other books, but with a sweeter edge to it (and still packed with well-drawn, head-strong, complex feminist characters). What I love about Vivian's books is they're so YA -- these are teens being teens, figuring out their teen stuff. When Amelia is offered the role of Head Girl at the local ice cream stand -- a legend in the small town she's from -- she's excited. It's a job everyone loves in a place everyone loves to wo This might be my favorite Siobhan Vivian yet! It's very in the style of her other books, but with a sweeter edge to it (and still packed with well-drawn, head-strong, complex feminist characters). What I love about Vivian's books is they're so YA -- these are teens being teens, figuring out their teen stuff. When Amelia is offered the role of Head Girl at the local ice cream stand -- a legend in the small town she's from -- she's excited. It's a job everyone loves in a place everyone loves to work. But when she discovers that the founder of the shop has died suddenly, everything is up in the air about that summer. Will the shop open? Who will be the owner? And when it's a young college boy who takes over, well, things might no longer be what they were. Written in third person, this book's voice and style are refreshing. It'll hit perfect notes with fans of Jenny Han and Morgan Matson. Amelia's relationships with her best friend Cate and with boss-and-cute-boy Grady are complex, imperfect, messy, and real. Amelia grows tremendously during this summer, and we as readers get to see it. What the end of summer holds is likely easy to see for readers who are along for the ride and believe in Amelia, but there's something really satisfying in knowing that's how things will settle. LOVED the use of a diary in this from Molly Meade, the founder of the shop. Her story is as fascinating as Amelia's, with her shop becoming the love of her life and her feeling that her beau -- who was off at war at the time -- wasn't supportive of her dreams. I knew I needed Stay Sweet by Siobhan Vivian the second I heard about its publication. This book has everything you could possibly want: summer vibes, ice cream, feminism, and friendship. I loved the ice cream parlour setting, and the main character is a strong leader. This book is cute and has an empowering message, and I would definitely recommend it. I really liked STAY SWEET, friends, and not just for the ice cream (though the ice cream part was obviously amazing). It’s the kind of contemporary I enjoy, with a summer of change, growing pains and still a lot of fun details too. The sweetest. I really loved this one. This book is the story of two women: in the past, there's Molly, who starts an ice cream stand in a lakeside town while she and the girls in her community wait for their sweethearts to come back from the war. And in the present, Amelia, who has worked at the stand every summer and has finally made "Head Girl." Until she makes a shocking discovery that turns her entire summer into question. All in all, I thought this was 31 flavors of cuteness. Read all my tho The sweetest. I really loved this one. 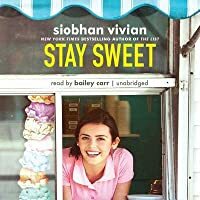 A huge Thank You to Simon & Schuster Canada, via Netgalley, for allowing me to read Stay Sweet by Siobhan Vivian in exchange for an honest review. My thoughts on Stay Sweet prior to sitting down and reading the book are that even though the premise for Stay Sweet is interesting, I wanted to keep my expectations low. I thought that Stay Sweet would be a story overflowing with fluff. Kind of like a dreamy summer read. Instead, Stay Sweet was more down-to-earth, more realistic. Amelia has gradu A huge Thank You to Simon & Schuster Canada, via Netgalley, for allowing me to read Stay Sweet by Siobhan Vivian in exchange for an honest review. My thoughts on Stay Sweet prior to sitting down and reading the book are that even though the premise for Stay Sweet is interesting, I wanted to keep my expectations low. I thought that Stay Sweet would be a story overflowing with fluff. Kind of like a dreamy summer read. Instead, Stay Sweet was more down-to-earth, more realistic. Amelia has graduated high school, and this summer, she’ll be working at the Meade Creamery before she’s off to college. Molly Meade dying was something that I don’t think ever crossed Amelia’s mind. However, when Molly is found dead, Amelia’s world seems to come down around her. From then on, the book has it’s high’s and lows. I honestly tried to keep my expectations of Stay Sweet low. I didn’t want to be disappointed by the end of the story. However, the more and more I put off reading Stay Sweet….the higher my expectations became. So while I did get a reality check while reading this book, I can say that I enjoyed almost every minute of Amelia’s story. The beginning of the story was cute, and the prologue really set the theme for what the Meade Creamery ice cream stand stands for. Which is a moving part of the story! Reading Stay Sweet made me want to go out and buy an ice cream maker and make ice cream!! When I read Stay Sweet, I had to take breaks in between, just because I was so immersed in the story and Amelia’s feelings would become my own. Which is a compliment to Vivian’s writing style, but a downer for me, since Amelia’s anxiety and stress became my own stress until I could separate myself from the story. I actually really enjoyed Amelia’s point of view. I enjoyed getting to know Amelia’s character and getting to know her fears, how she deals with stress, and the likes of friendship with Cate. I found that Amelia and Cate’s friendship was incredibly realistic, and I myself did not like Cate at some points, but that is just me. Something about Cate feels off, and I cant describe it. Like, if Cate were a person in real life that I knew, I’d probably be distant towards her. For the few first chapters, I think until chapter 8, I was waiting for the other shoe to drop. I’m glad to say that the shoe finally drops in the 9th chapter. Something that I absolutely loved was the fact that while there is some romance in Stay Sweet, it’s not the main plot of the story. The romance doesn’t take a huge focus of Amelia’s life. Nor does she immediately become jealous and severely attached to the love interest. I’ve got to say though, I called it when I thought that Amelia and her love interest would be a thing. Overall, I really wanted to end up giving Stay Sweet 5 stars. While I genuinely enjoyed it, the story was somewhat of a miss for me. I was actually really looking forward to reading Stay Sweet. I’ll admit that this book would have been better, had I not gotten my hopes up. I like what happened in the story: Amelia grew into her own skin + found out what she wants to do in college, and Amelia doesn’t become overly attached to her love interest (saw that coming miles away). I give Stay Sweet 3 stars. I liked this book. - but it got annoying at times. 3.75, around the 4 star range for me. I want to read the list. So this book was a nice summary read, it was so simple and drama free and I liked the atmosphere with the Ice cream stand and the girls friendship in there, it made me nostalgic to things in my own high school days, the simple story was fluffy and the romance was nice .. but nothing was really happening in the book .. up until the end .. I actually really liked this one. STAY SWEET is the best type of YA contemporary – it reminds you of all the great things about summer, explores a variety of different relationships, and is just an overall sweet read (you had to have known there was going to be at least one sweet joke here). It reminded me a lot of my favorite Morgan Matson novels like THE UNEXPECTED EVERYTHING. While I never had the opportunity to have a fun summer job by the lake selling ice cream, this book made me feel like I I actually really liked this one. STAY SWEET is the best type of YA contemporary – it reminds you of all the great things about summer, explores a variety of different relationships, and is just an overall sweet read (you had to have known there was going to be at least one sweet joke here). It reminded me a lot of my favorite Morgan Matson novels like THE UNEXPECTED EVERYTHING. While I never had the opportunity to have a fun summer job by the lake selling ice cream, this book made me feel like I did. The story starts off with our main character, Amelia, who is excited to return to her summer job at Meade Creamery as the Head Girl in her last summer before she heads off to college. Of course, nothing goes quite as planned and the death of founder Molly Meade changes everything, especially when one of Molly’s relatives shows up wanting to take over. Although there was definitely a lot that I liked about this book, my favorite thing had to be the ice cream. The fact that I felt like I was tasting creamy, delicious (nonexistent) flavors such as Home Sweet Home really says something about the writing. STAY SWEET managed to be perfectly descriptive without being wordy, and I found that the writing was easy to fall into and flowed so well that it was actually hard to put down, which is something I’ve probably never said of a contemporary novel. I also liked that while there was a romance, it didn’t overshadow the actual plot but enhanced it. It doesn’t have a whole lot of development, but it doesn’t come out of nowhere either. It feels natural and the two are able to support each other in all the right ways. There was also a focus on the friendships between all the girls at Meade Creamery, and the relationships the main characters had with their parents that eventually led to a lot of character growth. There were more than a few smaller plot points that came together in the end that tied the book together, which hints at how well-thought-out the entire story was. I do have to say that I’m not sure if I would consider this book feminist as the blurb advertises. Amelia is a strong character, but I feel like her and the other girls sometimes fell into a lot of stereotypes. This book started off and I was in love. I fell in love with the story of how the ice cream stand started and how it was run, but then things took a turn and my love diminished a little bit. The writing was dry and made it hard for me to really fall in love with the characters. Right now, I feel more towards the ice cream stand that I do the characters. Amelia was a nice girl sure enough, but overall I was rooting more for the business than anything which is an odd thing to think about. The frie This book started off and I was in love. I fell in love with the story of how the ice cream stand started and how it was run, but then things took a turn and my love diminished a little bit. The friendship throughout this was something that really grated on my nerves. It grinds my gears to see friendships struggle because of pettiness and nothing more than that. I don't want to read about a female friendship that struggles because of pettiness. If they are going to struggle, please let them have real problems. K? Thanks. I really enjoyed the ice cream stand storyline. However, I disliked the growing tensions when it came to the friendship between Amelia and Cate. I liked Amelia's character and I loved seeing her dedication and passion towards running the ice cream stand. On the other hand, I thought Cate was being really immature at times and it was frustrating. I wish we could've gotten to know more about the other Meade Creamery girls and their friendships with one another instead of the focus on the problems that Amelia and Cate were having. It felt like the author was constantly telling the reader that the Meade Creamery girls have a very unique and special bond/friendship with one another rather than showing it. "It’s the science of puberty. Girls develop faster than boys, emotionally and physically. How can any girl expect a high school boy to give her the moon and the stars when he’s basically an overgrown testosterone gland with legs?" This one starts off a wee bit morbid and blends itself into a sweet spot of friendship, new love, and ice cream. What more could any girl ask for? I have mixed emotions about this one. On one hand, I really enjoyed the story of the ice cream stand, how it came to be, an "It’s the science of puberty. Girls develop faster than boys, emotionally and physically. How can any girl expect a high school boy to give her the moon and the stars when he’s basically an overgrown testosterone gland with legs?" I have mixed emotions about this one. On one hand, I really enjoyed the story of the ice cream stand, how it came to be, and the close friendships between the girls. On the other, I was annoyed by so much. The fakeness feel of the "relationship" between Grady and Amelia, the pettiness of Cate to her "best friend" Amelia and how a family can tear each other apart without batting an eyelash. Pfft! Whatever! At times I felt myself giving up and I had to push myself to read more. That resulted in me reading more and finding something to hold onto. Which lead to that changing my mind. Then the rotation would start again. I just needed something more substantial and it never arrived. My absolute favorite character was Molly. I know, I know, she passed way too fast but I loved hearing her backstory. How this creamery came to be and her life while waiting for that one true love to come home following the war. I wish the story was all about her and not about Amelia and her boyfriend/boss or whatever name you have for him. Yawn! I was really hoping that this would bring me out of the depressive funk since this has been the week from hell but it didn't. Review originally published on my blog, Turning Pages. This book had all the promise of being a fantastic contemporary about friends, ice cream, running a business, and romance. But the book only truly thrived when Amelia was sharing her passion and love for her job. That was inspiring, to see her determined to honour her late boss and save the company that means so much to so many people. The descriptions of flavour and settin I received an ARC from the publisher in exchange for an honest review. This book had all the promise of being a fantastic contemporary about friends, ice cream, running a business, and romance. But the book only truly thrived when Amelia was sharing her passion and love for her job. That was inspiring, to see her determined to honour her late boss and save the company that means so much to so many people. The descriptions of flavour and setting were fantastic, so much so that it made me want ice cream. But my god the romance was disappointing. It’s one of the central plot lines, and it was not fleshed out enough for it to be believable. Grady is rude, sexist, and pretty closed off for the majourity of the book and then BAM! Romance. I don’t understand how Amelia grew to have feelings for him because he treated her poorly (and there was literally no hint of a romance aside from her finding him attractive). I thought the mysterty of what happened to Molly and the love of her life was fascinating, and did end up to have an unexpected reveal. But for a book about friendship, the friendship between Molly and her friends was better than that of Amelia and her friend. Amelia’s friend is pushy, and takes advantage of the situation. Frankly, if I were Amelia I’d be pretty upset with how someone who was supposed to be my best friend treated me. Yes, Amelia is flawed. But she is trying to save the ice cream store. The book is described as being feminist, but there are some very stereotypical characters: pretty girls being mean or being shallow or slacking at work. I had hoped not to see those stereotypes here. Gah! This book was SO CUTE!!!! And it was based around ice cream so hello perfect book right here! I loved the friendship relationship of this book too. Cate and Amelia’s relationship as best friends was entertaining and sweet to watch unfold. Also Grady was a great male lead. He seemed real and so did his and Amelia’s relationship which was nice! I would recommend this book if you like friendship, ice cream, and love!